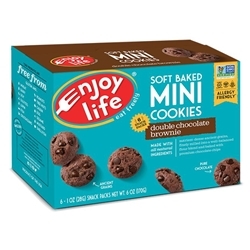 Enjoy these MINI chewy gluten free Double Chocolate Chewy Brownie Cookies studded with dairy free chocolate chips. Designed to fit your on-the-go lifestyle. No Trans Fat. No Artificial Ingredients. Kosher Parve. Vegan. Gluten Free. Casein Free. Non-GMO. Portion Control.